Lake Abbe is one of six connected lakes along the Ethiopia-Djibouti border and it literally feels like you’re on another planet. Exploring the chimneys across the moon-like landscape was a magical experience to say the least. Our journey took us straight from Djibouti airport to this wondrous destination, seeing mirages and baboons along the highway. The drive was around 4 hours and don’t expect an easy ride, it is mainly off road and it’s a rocky path. Take a travel pillow, not for sleeping, you’ve got no chance, it doubles up a head stabiliser! We diverted our attention to gazelle spotting and watching the random settlements of the Afari tribes where the children would run to wave and hope to get some presents. As the 4×4’s drew closer, we peered over the volcanic rocky hills and were faced with hundreds of ‘chimneys’ dotted along the landscape, pretty incredible. We headed in further to explore! The salt lake, also known as Lake Abhe Bad, is the final destination of the Awash River. It lies at the Afar Triple Junction, the central meeting point for the Arabian, Nubian, and Somalian tectonic plates, a defining feature of the Afar Depression. As the three pieces of Earth’s crust each pull away from each other, the earth cracks forcing magma to the surface and as the boiling water bubbles up, they deposit the dissolved calcium carbonates creating natural limestone chimneys up to 50 metres high. Steam escapes at the top of these formations hence the why they are referred to as ‘chimneys’. As we walked around in awe of these other-worldly chimneys, the sun began to set, or as our guide called it ‘sleeping soleil’. Sunset in these surreal surroundings really was an epic experience with the steam from the hot springs glistening in the sunlight. It will come as no surprise that Charlton Heston was inspired to shoot his classic 1968 film, “Planet of the Apes”, on the shores of Lake Abbe. There is only one place to stay in this bizarre and barren part of the world, this was the encampment with around 15 traditional Afar huts which are a wire frame covered in matting. Each contained two beds with mattresses and mosquito nets. I was pretty comfortable although don’t just pass out with sheer exhaustion and forget to drop the mozzy net. When the loud French man woke me up at midnight (one too many rums) as he went to bed, I could hear the high-pitched mosquitos buzzing around my head. There was a meeting place with tables and chairs for eating where we had dinner consisting salad and pasta rounded off with cardamom tea. In an effort not to get sick from the water, we took our own plates and cutlery, beware though, light plastic plates take flight in the blustery wind, everything needs to be weighted down. Next morning was an early start to catch the chimneys at sunrise, dressed and into the 4×4’s. The different perspective with sunrise allowed us to see the chimneys in another dimension, we followed the lines of the hot springs and looked in awe at this magnificent desolate land. I thought to myself how lucky I was to have had the chance to see this, not many ventured here. We headed across the vast salt flats to see the flamingos in the saline waters of Lake Abbe, it was quite a walk since the lake surface area has shrunk dramatically due to diversion of water from the Awash River for irrigation. You can only go so far before the quicksand starts, I’d love to have got a closer photo of these lovely birds but didn’t want to risk disappearing… bigger lens next time! Walking back the 4×4, there were a long line of donkeys heading towards us and Afari tribesmen tending to their goats, the nearest village is 200km but there’s a settlement of the Afari tribe by Lake Abbe. We were greeted by Afari children who’d set up a stall next to the 4×4’s for our return selling souvenirs such as animal bones, necklaces and rocks. If you get chance to go, do remember to take money and food for the kids, I completely forgot… think the early wake up clouded my planning! Back to camp for a simple breakfast of fried flatbread and Nutella before getting on our way to the monumental Canyon d’Adail, known to the Afar people as Dimbia. It is an intersection of rifts and land faulting, south of Ghoubbet el Kharäb. Quite an impressive sight! 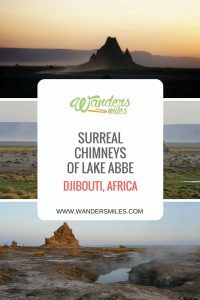 Djibouti is one of the top places to visit in 2018 and this natural phenomenon of the chimneys by Lake Abbe and the Dimbia Canyon are very much for adventurers happy to explore off the beaten track… you could even try venturing further into neighbouring Somaliland! If you’re not one of these travellers, get out your comfort zone, I can’t recommend it enough! Thanks for sharing your experiences here! We are all about looking for things “off the beaten track” as you say and doing something a little different, this really sounds like you did! It was a once in a lifetime experience, lucky to have been. You never know till you start the ball rolling… don’t think it will become touristy any time soon so you might be ok.
What an amazing adventure! Your style of writing transported me on the excursion along with you! Beautiful photos and helpful tips! I’ll be referencing this post when I can plan my travels here! Ah thank you, glad you felt that way about the article and the trip. It’s a trip not to be missed! What an incredibly unique experience, it really does look like a different planet and one I’d never heard of until now! The photos of the baboons are incredible! It’s definitely off the beaten track that’s for sure. The baboons are not to be under-estimated, they are one of the predators of Djibouti, I stayed in the 4×4! I like the unique active adventures more than tourist attractions, and this looks like one that I’d love! What an amazing experience. 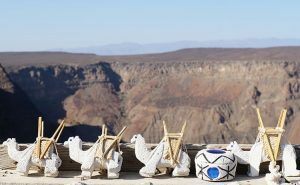 The chimneys, flamingos and salt flats! Amazing! I’m sold. what an amazing adventure. It reminds me of the Chimney Flats around Mammoth California! I love that you stayed overnight in a local encampment! To see all the animals and local herders would have been a true bucket list experience for me! Those landscapes are amazing! They kind of remind me of photos I’ve seen of Utah but less orange/red. What a cool place to visit, I haven’t heard much about Djibouti so I’m really glad you shared this! Great post – beautiful sights mixed with adventure. 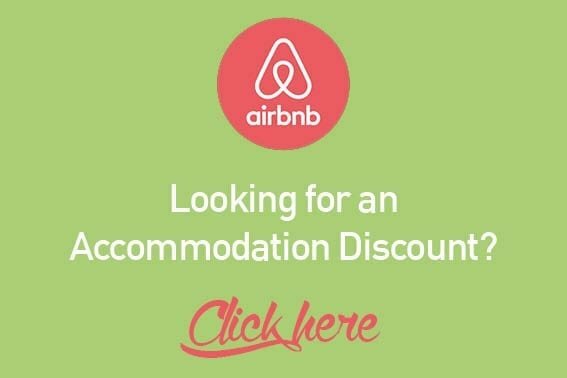 Travelling Africa is not so common so its especially great to read posts by users with sinilar passion and about trips to bit less common areas! Thanks for sharing! Amazing photos, sounds like an unbelievable trip. I love the monkey! Great post! You inspired me to add Djibouti to my ‘off the beaten path bucketlist’. Thanks!